Welcome to this highly valuable appendix which should be used along with Passion4FM’s Football Manager 2019 Barcelona Tiki Taka tactics. Here I will look at the different Football Manager player roles used in the tiki taka tactic and which key player attributes and traits (aka player preferred moves) you might need to improve the performance of the players in order to implement the tiki taka possession football at any club in Football Manager successfully. 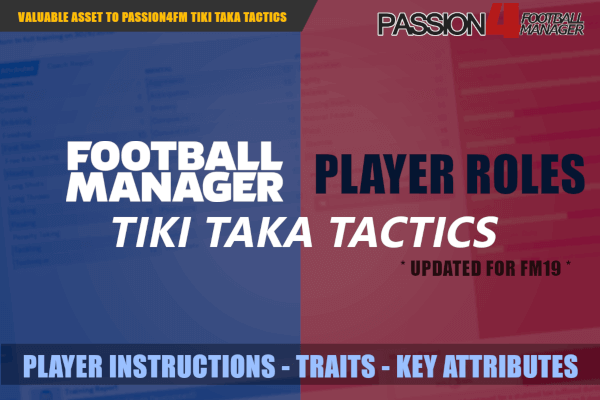 I will simply go through the player roles of tiki taka tactics highlighting their main responsibilities in and out of possession giving you the key attributes for the roles in order to replicate the positional system required to succeed with Passion4FM FM19 tiki taka tactic. 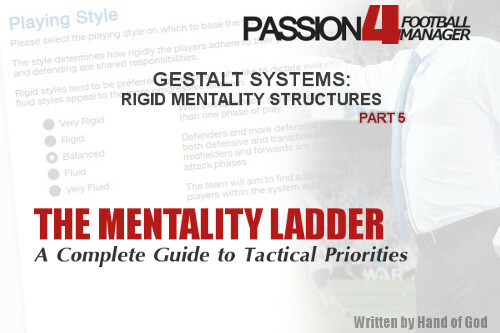 This article is an important read for anyone who have downloaded the Passion4FM Tiki Taka tactics and wants to get the most out of it. In order to fully enjoy our Football Manager 2019 Tiki Taka Tactics, it comes very much down to the players at your disposal – either you’ll develop players into the player roles used within the tactic or you’ll spend money on buying the correct players for this extreme possession tactic. Below I’ll also provide an insight to what you can expect from the player types based on statistics to successfully implement this advanced playing style. The screenshots of statistics included are taken from my current FM19 save at Auxerre, but shows you how the players will generally perform within the tactics and therefore point out necessary skills. Continue reading to learn more about the requirements of the player roles of Tiki Taka tactics and their behavior, movements and tendencies within this highly advanced tactical system, which is build on numerical superiority, compactness in additional to quality superiority. Enjoy this read and remember to share our Barcelona tiki taka tactic to your community and with friends! While I used a traditional Goalkeeper defend previously, due to some bugs in regard to his poor positioning, making it easy for the opponent to lob the ball over him, I have reverted to the most natural choice for FM19, the sweeper keeper attack. The sweeper keeper will be the mandatory choice for all tactical systems utilizing an high defensive line and looking to play the possession game. He will be as active in the retaining of possession as any other first team member and requires as great technical skills as specific goalkeeping abilities – like a more traditional goalkeeper. The sweeper keeper will be part of the build up play acting like the 11th outfield player, but not in the same manner as Manuel Neuer. He will act as a pressure reliever for the central defenders and the wide wingbacks when building out of defense. As a passing outlet it’s important that he never lose focus but patrol the area from side to side according to the ball location. Acting like a sweeper the goalkeeper will have the best vision on the field to anticipate play and aid the ball circulation forcing the opponent to move in order to create spaces to exploit. His technical abilities in terms of passing will be of importance in order to continue the ball circulation in the defensive third. It’s important that he uses a risk free approach, hereby meaning making short passes to the closest available player rather than hoofing the ball long (to the wingers or the forwards) as this will damage the attacking shape and overload we are looking for – meaning that the wingbacks will not get time to push as high as I prefer. A long ball will often go over the head of the wingbacks they will not be part of the play in terms of being a valuable asset in the horizontal stretching of the play. Since I want to win back the ball as quickly as possible in the opposite half, and will play the majority of the match in the opponents half – close to their penalty box, it means that the sweeper keeper will spend most of the match watching the play. His ability to concentrate and anticipate what might happen will often determine his performances when he needs to engage in play, either he has to rush out to swoop up long clearances or come out of his default area to pick up loose balls or imprecise counter attacking balls. His abilities to intercept vertical passes in the first stage when losing possession and decision-making abilities to intervene or not, will be decisive. His one on one abilities can often be the fine line between conceding a goal due to the extremely high defensive line, as it’s often 40-50 meters between the last defenders and the goal, meaning that the tactics are very fragile for counter attacks. His quickness and bravery to rush out to narrow the angles for a shot on goal and his reflexes and agility as a shot stopper, in the same mould as Victor Valdes, are what I want. NOTE! These attributes comes in addition to the default goalkeeper attributes handling, communication, aerial ability and command of area. It’s especially important that the goalkeeper has low eccentricity not taking any unnecessary risks between the post, or with the ball at his feet. The central defenders will be the third line of defense having the key job to project the center channel from shots and penetrating passes from zone 14 or simply look to regain possession by intercepting counter attacking balls or rushed long kicks because of the high pressure from the three forwards at the opposing defensive line. The central defender will stay in line with the ball playing defender and primarily hold position at the half way line when play is in the final third. These two defenders should be positioned rather close to each other in order to force the opposite team to play around them rather than moving between them. In possession they will provide depth in ball circulation giving them the chance to lay off passes and divert play from side to side. They must be capable and comfortable to utilize a quick short passing play under high amount of pressure – working under the rules of the modern central defenders. Since I prefer to play out of defense the passing length for the central defenders will be short – participating in the quick short passing play tiki taka is famous for; either by relieving pressure for the left wingback, the deep lying playmaker defend or as the primarily passing options for the goalkeeper because of the instructions to distribute the ball to the central defenders. With full vision of the pitch and the players positioning they can easily change the point of attack by for example passing between the lines to the deep lying playmaker support or help to redirect the ball from the right wingback to the left. As the technical abilities with the ball are as important as their tactical abilities in terms of defending, a central defender of the tiki taka tactics can be related to a ball playing defender. One vital thing to mention is that while you may want to search by a ball playing defender in the transfer market I like to use a ball playing defender / central defender partnership in the tactic because of BPD tendencies to play more risky passes making play to vertical for my taste. But here can adopt the role by applying traits like plays short simple passes. By selecting two defenders with defend duty I like it to be easy for the team to be able to push up in order to utilize offside traps. Since the defensive line is set extremely high (at half way line) which leaves a lot of space to be countered in, off side traps is first and foremost one part of play. Their quickness (acceleration and pace) to deal with as quick forwards as themselves, and to be able close down, track their opponent and simply give opposing players less time on the ball will aid how quickly you regain possession and provide the security needed in order to play with a high defensive line. Another is their capabilities to man mark the opposing forward(s), giving the player(s) less chance to turn with the ball. With closing down much selected in player instructions and their natural high positioning it favors a tactical intelligent defender who can intercept passes and penetrating runs. 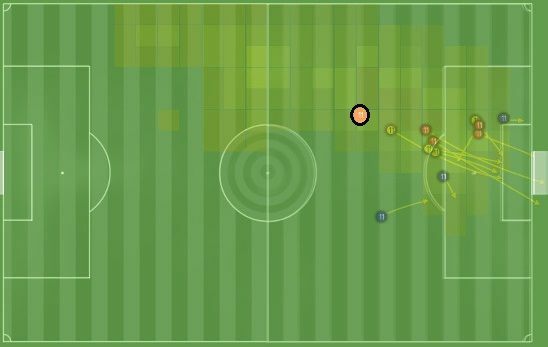 The importance of anticipation and positioning in combination with the level of closing down lets you experience the most interceptions from the central defenders throughout the season and each specific match, something this screenshot illustrates. As a tactical adept defender, the central defenders defend, will act more similar to a stopper duty, in my point of view, since their player instructions in terms of closing down will instruct them to push out of the line when an opponent enters his zone, which can be risky. Hopefully it lets you regain possession before the opponent reaches the final third. The defensive line will be a 3-1 single cover line when one of the DC’s pushes out. If play are directed down the sidelines the nearest central defender will have the important duty to cover the space behind or slightly to the side of the wingback. The central defenders has to make the correct decision all through the match. Here it’s the important question; “shall I track the runs of the opposite forward or cover the space which the (attacking) midfielder or forward can run into in case of through balls as every beneficial passing options are tightly marked for the opposite side. If the play reaches the defensive third I aim to overload the zone 14 by a narrow formation with five players in the center, who are closely connected. Here their ability to position themselves correctly, their ability to concentrate and their marking abilities will be mandatory in order to restrict passing options and deny spaces to exploit. It’s important to use tactical disciplined players who understand what is required of them in every situation and puts 100% focus on protecting the goal and their team mates by excellent positioning. In some situations it may be important to hold the position, while in the other to cover. The understanding and cohesion between the two central defenders is important too. Their ability to react according to each other or depending of what the other does and supplement each other (quick vs brave/strong) can be the difference between 1 goal conceded per match or none. NOTE! It’s also important to note that according to the opposition instructions detailed on the main post of the tiki taka tactics I prefer to man mark lone strikers. For example against a 4-2-3-1 with one AMC it’s important to field central defenders where one is quick and have the ability to read the game (covering), while the other has the ability to man mark. The above player attributes comes in additional to aggression, tackling, marking, strength and bravery. The central defenders are also one important factor at defensive and attacking set-pieces so heading and jumping reach will be two attributes to look for as well. Since I covered much of the ball playing defender above, what separates the central defender and the BPD within the tiki taka system is the difference in vision and passing technique. In my opinion the central defender should feature higher aggression, marking and strength similar to Puyol, while the other may be quicker, more agile and are highly comfortable of retaining possession – turning defence into attacking if the playmakers are marked out. You are able to search by the difference in key attributes when downloading the player role search filter below. The wingbacks of the tiki taka tactics needs to fulfill a wide variety of duties and responsibilities. From providing defensive cover and security in the defensive third to provide attacking width in the final third. The many aspects of their play will set high demands on the player – his level of attributes and type of skills (player preferred moves). While the different tactical systems provided may use different roles and duties for the wingbacks (right and left) I think it’s worthy to highlight the overall key attributes required of the wingbacks before taking a closer look on the specific roles of left and right. The wingbacks of my systems needs to cover the complete wide channels running up and down being part of all phases of play. With an average running distance per match between 11 and 14km there are huge physical requirements. secondary attribute: work rate; be able to offer a passing alternative down the wide channel by intelligent off the ball movements and a determination to get involved with play so the team can create a numerical superiority around the ball zone in wide areas. NOTE! The two wing backs due to their height is also set to stay back at attacking set pieces. Their acceleration and anticipation in these situations will determine how well they can intercept counter attacking moves and direct balls played around or over them. The complete wingback (right flank) will have some slightly different responsibilities than the left wingback since he is demanded to influence the final third in the majority of the match. The complete wingback is used in the 2-3-2-3 formation which transits to 2-1-4-3 / 3-1-3-3 and looks to serve the role similar to an attacking winger. The complete wingback is picked to replicate Daniel Alves’ play and looks to be an example of how the system should look like in my point of view. Due to his positioning in the final third he will be one of 4 players who will create chances, either it’s by penetrate the defensive block with forward runs from deep, or through balls from wide. The complete wingback will also record a relative high amount of key passes in regard to his default position, sometimes leading him to create the most key passes in the entire team. His dribbling abilities and positioning in terms of stretching the play will be an important factor in terms of overloading the right flank; either driving to the byline or creating space for the inside forward who stays deeper than a traditional IF attack and narrower than a traditional winger. He will record an high amount of runs past opponent trying to get to the byline for through balls or low crosses towards the back post. which is further influenced by his level of flair, vision and decision-making on when to get forward or when to hold position to offer support for the ball circulation. As a wide pressure reliever he will offer a third passing option for the players around him as he will literally be available at all times. He will be the main outlet in companion with the wingback left for the midfielders, who will switch ball to the other flank. The CWB can quickly make pin pointed and penetrating passes from wide into the penalty box, or crosses from the byline. Remember the complete wingback attack may be one player who will end up in situations where he can shoot at goal within the penalty box. A decent finishing / long shot attribute may be worthy depending on what you’ll want from him: finishing off attacks quickly or get into the penalty box. This means that I emphasize attacking attributes more than the defensive ones for this role. It doesn’t mean you should simply overlook his defensive abilities, but that you should prioritize attacking abilities over defensive abilities if you find yourself in the position to sign two approximately similar players for this position. Instructed to influence the play in the attacking third for the majority of the match, the complete wingback needs to put immediately pressure on the opposing player to regain possession as fast as possible. His aggression in relationship to his closing down setting will ask him to push out of position to limit both space and time for the opponent with the ball. This normally happens when the team loses possession in or around the final third. In order to regain possession successfully at this stage, it’s important that the deep lying playmaker support will provide a defensive security. The CWB level of aggressiveness in this phase is determined by the positioning of the IF-S and the F9. If there is not a numerical advantage around the ball zone or the play is in the defensive third, the CWB will track back working alongside the central defenders accordingly to a traditional 4-man defense, taking up the responsibilities similar to a traditional fullback. Here I want him to stick close to his opposite marker, normally the opposite winger. By tight marking the players within his zone I like him to rely on his anticipation, decisions and acceleration to intercept passes made from the wide channel through the half space into central channel. These types of interceptions is something I look to encourage to happen by opposition instructions, but that’s a topic to discuss later. Forced to conquer wide players with excellent dribbling, balance, agility, acceleration and pace the job of the complete wingback forces him from time to time to make late tackles and be forceful in the hunt for possession, either its helping the team regaining possession in the opposite half or make those important tackles wide outside of the penalty box as he rushes out to close down space and time for the player in possession. The key attributes of the wingback support / attack and the complete wingback attack is approximately the same when the team is out of possession. Both are part of the second line of defense, but can drop into the third line of defense when the team is pushed back into the defensive third. The wingbacks will have an important duty to squeeze play high up the pitch – narrowing the horizontal width of the formation by moving inside – closer to the action. The wingback support of the basic 2-3-2-3 formation looks to counter the attacking threats of the opposite right winger replicating the duties of Eric Abidal. The left wingback will be more defensive minded and look to aid the ball circulation with far less advancing passes being made. He will utilize a passing approach to retain possession first and foremost. His job is to cover for the attacking responsibilities of the advanced playmaker attack (MCL) and inside forward (left), relieving pressure and redirecting the ball to more creative players in the center. He will aid the build up from the back far more than the complete wingback attack as he creates a third passing options for the central defenders. The wingback support left will not overlap on the left flank that much, but provide security for the team in ball circulation for the majority of the match staying in the line of the deep controller, giving the team a chance to change the point of attack by redirecting the ball from wide left to the central playmakers. While the CWB has a tendency to cross from byline with accuracy and pace, the WB-S will limit his amount of crosses. For me crosses equals to giving possession away to the opposite team, since the chance of scoring from crosses is minimal. He will be far more predictable and tactical disciplined than the CWB, but give the chance for the IF left in the mould of Neymar to fully utilize their creative freedom. NOTE! If the opponent is not likely to cause havoc down the left flank and the team is inferior, I recommend you to select wingback attack, converting the 2-3-2-3 formation at fluid shape to a flexible 2-3-5 formation, giving you the chance to overload the left flank with numerical superiority too. In these situations, the player requires similar attributes in possession as the complete wingback with the ball. The defensive midfielder can be described as the backbone of tiki taka tactics as everything revolves around his player role and duty: his positioning and movements from phase to phase, or in other words his mentality and responsibilities. He’s the primary holding playmaker who stays in front of the central defenders helping to protect the defensive line from breaking players and penetrating passes. This is also one positions I have struggled at times to replicate (Football Manager 2017 and earlier) as I have found it difficult to recreate the movements and duties of Sergio Busquets. With the ball he makes what is difficult look easy: he disposes of the ball with one or two touches. Without the ball, he gives us a lesson: that of being in the right place to intercept and running just to recover the ball. The defensive midfielder of my system will cover a larger area than the traditional anchor man, but not as large as selecting the regista role that could be other options for a possession tactic. If we should entitle the area outside and in front of the penalty box as the ‘Messi zone‘, we can entitle the zone as the ‘Busquets zone‘ unifying the defensive triangle with the attacking creative one. Because of the attacking wing backs the player has quite a large area to protect and cover. We can say he is rather isolated with less support, despite the deep lying playmaker support will act somehow as an second holding midfielder out of possession. While Xavi (deep lying playmaker support) orchestrate the passing tempo in the final third, the deep lying playmaker in the mould of Sergio Busquets will be the maestro of the players positioning – pulling the strings of the foundation of tiki taka; the positional play. For example when Busquets drops deep at goalkeeper distribution it’s a synchronized movement within a split second of the other players around which literally dictates the central defenders to push wide, the wingbacks to advance further up and DLP-S (Xavi) to find / open up space by coming deep to get the ball, which eventually draws a marker out of the opposition block, relieving available space for Messi or the wingers to exploit, who roams out of position or comes closer to the ball. In my point of view, Sergio Busquets’ playing style is something between a traditional holding midfielder (DM), the revival of the half back and the traditional deep lying playmaker packed together in a style of play which is unique. and in addition to push wide to help the wingbacks to deny passing options into the center by covering the zone behind the first defender (acting like a second defender) when play is directed towards the sidelines. As you can imagine, the defensive midfielder of my tiki taka tactics can be described as the free man of the system, providing numerical superiority in all phases of play. It’s important that he covers zones rather than marking opposing players. He shall be free to both intercept passes, protect the back four by intelligent positioning, help to regain possession by covering vulnerable areas by quickly engaging in tackles or marking zones when out of possession while being technical adept and creative to split the opposing defensive lines apart by clever third line passes to reach the final third when the opposition is unbalanced – initiating attacks from deep. In the build up phase, under pressure or when the team needs to switch the point of attack he must quickly recycle possession. This could be compared to the role of the defensive midfielder defend. Sergio Busquets himself have set the minimum expectations for what we want from this position in Football Manager: an extremely high passing completion ratio, lots of interceptions and a high tackling completion rate. He shall have the mental physic to simplify play despite being able to cover larger areas, which normally affects any players level of concentration. It’s not without reason the position have been given to the player with the best ability to ‘read the game’ and spends the least of time thinking on what to do next, in order to maintain the high passing tempo. This is something which stands out from the Busquets role compared to other holding midfielders before him and in present time; the ability to not hold the ball too long but to recycle possession at a minimum of two touches with a clear intention of moving the ball forward, hopefully between the first and second line of pressure. anticipation; being able to predict and react to what will happen next – always being one step ahead of play either it’s in the defensive or the attacking phase. The DLP-defend will primarily stay back at all times, holding position in front of the central defenders or pivoting between them by coming deep to get the ball. He is used primarily against formations with one forward, like the 4-2-3-1, 4-1-2-3DM Wide, 4-1-4-1 and 3-2-4-1 (5-4-1) as the 2 central defenders will provide the required numerical superiority against the single forward. The system when the DLP-D drops between the central defenders, which he will normally do when the team is in possession of the ball, will be narrower – forcing the opposition team to counter down the flanks rather than through the center. By overloading the center channel it will create a higher defensive balance providing better cover for the adventurous passing play of the advanced playmakers, who constantly looks to pass between the lines utilizing third line passes. This means that I prefer to use the half back role primarily against systems with 2 forwards or against a 4-2-3-1 where it’s clear to see the opponent is using a shadow striker. While his basic tasks and movements might be somewhat similar in possession it will change the team shape completely. But back to the default role of my preference, the DLP-D. When in possession of the ball the deep lying playmaker will have great vision of the entire field as most of the players are in front of him. His technical ability in terms of passing will be highly important. Similarly to the advanced playmakers I want him to initiate attacks from deep – making play more unpredictable. The opposition must now take into account his ability to dictate play and make penetrating passes as well. This will literally decrease the impact on the team play if the DLP-S is man mark by the opposing team, which is the primarily player to dictate the passing tempo. The deep controller (DLP-D) is not only encouraged to make more third line passes, but also to move the ball quickly by acting like a pressure reliever for his team mates. He must move the ball without taking too many touches meaning that it’s important that he knows where his teammates are at all time. In order to increase the amount of passing options for the player with the ball the deep lying playmaker must cover a lot of ground helping to increase the amount of triangles while assisting his team mates. Described as the deep controller the DLP-D is encouraged to use a wider variety of passes, either it’s when building out from the back or when recycle possession from the middle third into the attacking third. Here we must remember that when play is in the final third, the DLP-D will stay back at all times not being involved in the attacking phase, but hold a position which provides depth and a secure passing option for the others – able to switch the point of attack quickly from deep. Decisions; where do I need to be positioned in order to increase the amount of passing options for my teammates and where shall I pass the ball in order to pass it out of pressure? We can also take into account the importance of the DLP-D to hold up the ball using his body (strength) as a shield while the other players around him gets into position creating the triangles which is needed to continue short passing play. In these situations it’s highly important that the DLP-D is not dispossessed since he is often positioned in front of the central defenders under a lot of pressure. Playing in an integral role without any specific defensive midfielder partner, his technical abilities to get the ball out of pressure is highly important compared to using a double pivote. The holding midfielder of my system can be described as both a ball winner and a possession retainer. Despite the deep lying playmaker is part of the defensive unit he will be mostly involved when the team is in possession of the ball, especially in the build up phase. This does not mean he is not essential when the team looks to regain possession. In fact he is the heart of the team at this stage since his positioning determines what the other players shall do. If the DLP-D decides to close down the ball, pushing out of his default zone, it gives the players behind him the chance to push up as well. In these situations the players on the sides of him (advanced playmakers) must stay rather than move – cutting of passing options. As you’ll see, everything revolves around him, despite he won’t make any clear impact on the match score and result, since he is not required to score goals or assist the forwards. He will not record lots of goals or assists, but some key passes and a passing accuracy close to 90%. Instead he will record a decent amount of interceptions per match, an higher tackling completion ratio (also close to 90%) and a great deal of key tackles. While this may seem boring compared to a player who scores over 40 goals a season or makes +3 key passes per match, his main duty is to protect vulnerable areas helping the team in the pressing play, which is essential for the tactic to work. In the defensive transition phase the DLP-D is demanded to dispossess opposing players without diving to the ground. If forced to make tackles I want him to stay on feet dispossessing the opposite marker with his body strength and ability to anticipate what will occur. Primarily I want the DLP-D to intercept passes before it reaches the opposing players feet. Therefor it’s important that he is already positioned well according to where the ball might land (anticipation, positioning and decision). I want the DLP-D to cover zones rather than a specific player, which is why ‘Tight Marking’ is not set. This gives the player the ability to act as a free man (spare player) providing the highly needed numerical superiority around the ball zone in order to win back the ball as fast as possible by cutting off passing option for the player with the ball. The DLP-D is instructed to close down more which let us experience something similar to a defensive midfielder defend or a regista as he will push up closer to the advanced playmakers helping the team to regain possession higher up the pitch. This is essential in order to utilize the compact unit which looks to deny spaces and which immediately puts pressure on the nearest ball carrier. The player instruction of close down more together with the team instruction push higher up lets the central defenders to position themselves higher up, providing the high defensive block which we are after, which squeezes play – letting the formational lines stay close together. The intelligent positioning of the DLP-D is important in order to limit the time spent in the defensive and attacking transition phases. As an important figure in the teams collective full pressing play I want the single holding playmaker to tight mark opposing player only in specific scenarios when it is needed to restrict the amount of passing options for the player with the ball. It will be the players primarily individual tactical intelligence in additional to his positioning which determines if he shall tight mark opposing player or zonally mark a vulnerable area. Ought to play in the same position as the one who literally defined Barcelonas tiki taka playing style, there are high demands on the player who shall take up Xavi Hernández’ role within the tiki taka tactic. The one who shall adopt the tactical responsibilities and duties of the legendary Xavi must both be technical and tactical gifted. He doesn’t need to be a fast player as long as he is agile. He does not need to be strong nor tall, as long as he is quick-minded. Described as the second controller, ‘the Xavi role‘ binds the defensive and the attacking unit together, pulling the strings on when the team shall advance play and enter the final third or when the team shall retain possession waiting on a better moment to initiate an attack. The players around him will look for him in all phases of play, giving him the license to utilize his astonishing creativity with the ball. With the ball at his feet I want him to retain possession purposefully. This means that it’s required of him to understand when it is needed to hold position or when to roam – finding pockets of spaces to utilize and then play the ball to the feet of his teammates. For me the player in this position equals to one who shall make himself available for a pass at all times – mainly by dropping between the line of the midfield and defense strata, or by coming deep to get the ball. The player shall dictate the passing tempo – utilizing a waste number of passing types, either it’s quick short passes to nearby players (to relieve pressure) or by pin-pointed through balls into space. With a number of passing types in his vocabulary, he is an creative architect, who shall destabilize the opposition defensive block by forcing them to move sideways or out of position by his movement and passing. Here is his ability to thread passes with accuracy to a breaking player further forward (IF-S, CWB or F9) preferred. I have picked the most natural player role to replicate Xavi’s positioning and playing style in Football Manager 2019. While some would feel the roaming playmaker replicates Xavi’s responsibilities the best, I have picked the deep lying playmaker support. With the option to tick Move into channel and more risky passes as not a default behaviour, the RPM could be seen as an ideal option for many. But I don’t like the RPM tendency to dribble with the ball as I rather have passes spread quickly around. From the player instructions I can also understand that the DLP-S will be less likely to shoot from outside the penalty area and instead play those killer passes from deep, due to his lower mentality, which makes him far often available when play is in the final third – close to and around zone 14. At this point I would rather work around the DLP-S by adding PPM’s and selecting appropriate player instructions for my style than to select the RPM. When that’s being said, I tend to select advanced playmaker support with player instruction ‘Hold position’ ticked in order to encourage more penetrating runs from deep and into the penalty box – supporting the false 9 better. team work; primarily a team player who follow tactical instructions and works for his teammates. with unique Vision of the field he knows where his teammates are at all times and where his passes shall go in order to put pressure on / destabilize the opponent. the DLP-S is often the one with the second best anticipation of the team. His ability to predict what might happen and get into the required position to receive or regain the ball makes him an astonishing great player. decisions; what is the best to do in the current situation? Where shall I pass and what is needed at the moment for my teammates to get more space? Together with the second central midfielder (AP-A) the DLP-S will have an important task to cover the entire pitch moving according to where the ball is, no matter if it’s in possession or without, in order to both increase the amount of passing options and reduce the vulnerable zones the opposing team can exploit. A decent work rate and stamina gives him a great foundation to do his job without making too many mistakes in regard to level of concentration when he gets exhausted. 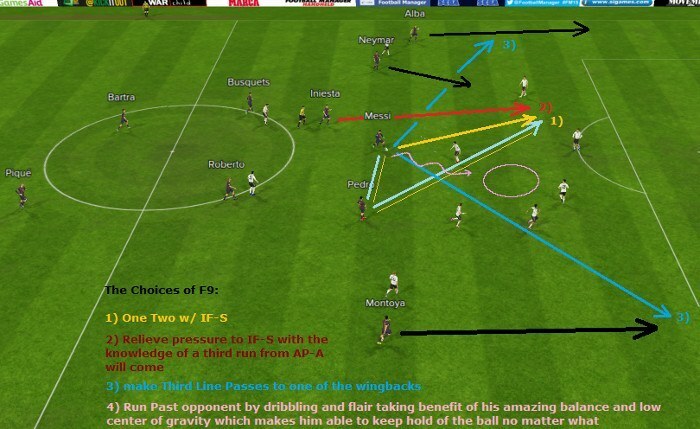 and most importantly pass the ball purposefully – mostly in a bid to penetrate the opposing block by third line passes. In the build up phase, for example when playing out from the back, the deep-lying playmaker will hold position between the lines of the opposing forwards and (attacking) midfielders. The DLP-D and the central defenders will constantly look for him as the tip of the triangle. With the ability to play the ball out of pressure in an instant, he will let the team move the play out of defensive third limiting the transition phase. As he gets the ball it gives the complete wingback attack time to get forward and the false nine to drop deep. By recording the most passes per match and the most touches I want him to make those final passes that lets the team enter the final third. In the final third the DLP-S will hold position within zone 14 – right outside of the penalty area, making himself available when the team pressure the opposing team back into the penalty box. See illustration here. If the ball is on the right flank he will mostly be available for a 90 degrees pass from the byline, as an alternative to a cross. The deep lying playmakers ability to penetrate the opposition defensive block by accurate passes from outside the penalty area lets him record a great amount of key passes and assists throughout the season. This means that he will be far more likely to play advancing passes to the false nine, the inside forward (right) or the complete wingback. At all times he will have the support of the DM and AP-A which he can relieve pressure to, if needed. Most often can the horizontal pass to the AP-A be the one which leads to a clear cut chance, a goal or a half chance, as the AP-A will feed the false nine or the IF (left) with the final assist. With under 1 shot on target per game and few dribbles made per match it shows how he shall aid the team to create chances and unsettle the opposition out of their comfort zone by intelligent passes rather than penetrating runs and long shots. Playing alongside the midfield maestro, the advanced playmaker will provide alternative passing options to play their way out of pressure, and will be one of four important players to dominate the center – which we aims for. My aim with this position within the tiki taka playing style is to have an highly unpredictable player who can create chances both for himself or others, who can destabilize the defensive block by creativity, purposeful runs and movements and who can offer a third choice when everything else looks dark and impossible. Even though he will hold position to the side of the DLP-S, the advanced playmaker will offer more attacking creativity than the more ‘defensive minded’ deep lying playmaker. When the DLP-S will mainly spread the ball horizontally, the AP-A will offer more vertical play – constantly seeking to enter the final third. His main duty is to penetrate the opposing lines and defensive block with vertical penetration. This can come from a vast amount of movements, as I prefer him to get forward whenever possible, but also by a more expansive passing repertoire such as more through balls. When I look at the DLP-S as the ‘pass retainer‘ – the one who dictates the passing play so the team can advance into the final third, the advanced playmaker attack can be regarded as the ‘chance creator‘ – the one who shall utilize his creativity solely on creating opportunities for shots. I have selected the advanced playmaker attack due to his natural ability to drop into holes which aims to dictate that the other players will always look for him in the final third, and then be highly creative with the ball – supporting the false nine and the IF (left) with through balls from outside the penalty area. The advanced playmaker attack can also be switched to a mezzala attack if you like the tactic to be a bit more vertical – by increasing the number of forward runs from deep midfield. By changing the role to mezzala you might reduce the number of passes completed but create more movements that has an higher chance of destabilizing opponents who ‘park the bus’. Some would even resemble the responsibilities and duty of the MCL to a box to box midfielder as he will utilize the full length of the pitch in order to help the team both in and out of possession; providing passing alternatives, relieving pressure for his surrounding teammates, make those important third runs, play those killer passes, cut off passing lanes and harass opposing players with aggression in order to regain possession as quickly as possible, in or on the edge of the middle third, and finally track back in the defensive (transition) phase. In additional to excellent technical abilities, there are high physical demands set on whom to take up the role and duty of the advanced playmaker (read Andres Iniesta). He will not only be one of the top three players (if we consider the wingbacks as one) with the highest running distance per match, but also the one with the second most passes per match. This is a result of the way the opposition defend – normally very narrow in or around the penalty box as the team will look for the AP-A in the final third because of his abilities to switch the point of attack, for example from left half space to right flank. His abilities to retain possession when under heavy pressure when the formation has transit to a 2-3-5 formation in the attacking phase is of importance, since only the DLP-D will cover him. In the build up phase the AP-A will look to increase the amount of advancing passing alternatives for the central defender left and the deep lying playmaker defend. His position, playing between the lines of the central midfielders and the central defenders of the opposing team looks to stretch their formation diagonally. A pass to the AP-A can quickly give the team the chance to play out of heavy pressure and/or enter final third as both the false nine and the right inside forward have vast amount of space. But if he is isolated and under pressure, his abilities to retain possession purposefully will be favoured. Here can those quick short passes between the playmakers of the midfield triangle help the team to get out of pressure, but his tendency to switch possession to the other side of the pitch can relieve pressure too. In the final third will the AP-A look to destabilize the opposition defensive block by penetrating runs from deep. Either the runs comes from a third run or from a quick one-two with the false nine or the IF (left) it doesn’t matter as long as he will look to get forward into the space left open by the false nine who has dropped deep. His ability to exploit any gaps appearing by dribbling and moving into channels makes him almost always available on the edge of the penalty box. Normally you will experience that the AP-A will seek small spaces dragging himself away from his marker, get the ball in or around the halfspace and then run towards and past his opposing marker with the ball before quickly make a through ball to the IF-A, who is clear on goal. While the DLP-S will record a high passing accuracy and a decent amount of key passes, will the AP-A record more assists, an higher amount of key passes and dribbles made throughout 90 minutes, at the expense of a bit lower passing accuracy. As you will notice, the advanced playmaker attack will also record more shots on target than the DLP-S, but far fewer than the false nine, because of his natural positioning in the attacking phase. vision to see potential openings and decisions to make the correct choice for each situation. Here would some of you perhaps favour him to stop play now and then to draw opposing marker out of their block and let the wingbacks move higher up the pitch in the attacking transition phase, but I find the passing tempo slow enough with the team instruction lower tempo set at Balanced mentality and slightly shorter passes ticked. NOTE! 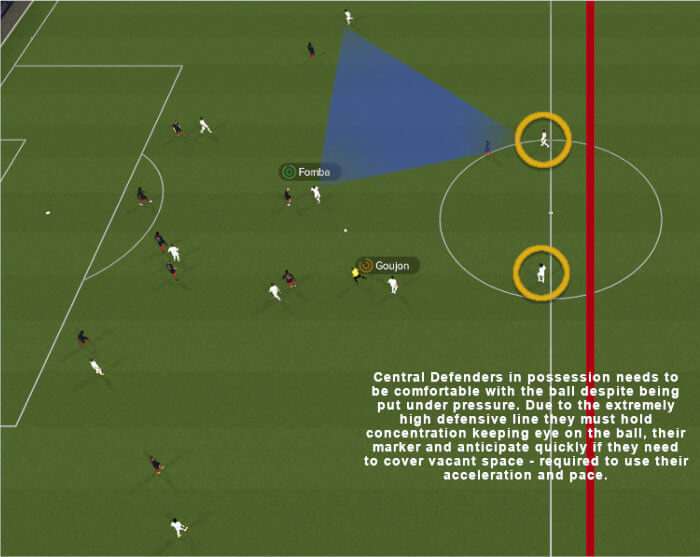 Here I will move outside the default template of this article by looking at the two central midfield roles; deep lying playmaker support and advenced playmaker attack at once. This because the player attributes required is pretty similar as their duty in this phase is approximately the same. Part of the second line of defense are the deep lying playmaker and the advanced playmaker in companion with the wingbacks. When the team looks to regain possession the DLP-S and the AP-A looks to aid the team with their positioning and anticipation. Depending on the ball location of course and the situation, the deep lying playmaker support and the advanced playmaker attack will have an important job to reduce the opposing ‘playmakers’ space and time with the ball. 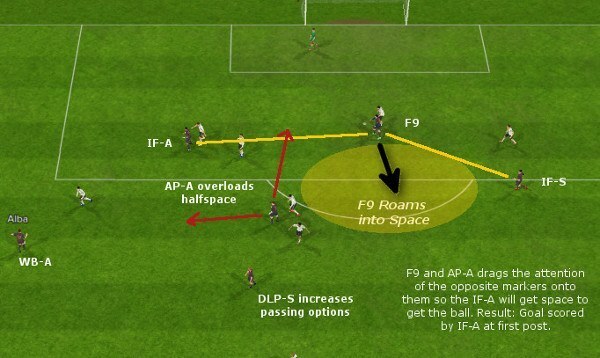 As the three forwards close down the defense at all times when the opposing team is building out from the back, the DLP-S in companionship with the AP-A will do a valuable job to cut off passing options and limit passing lanes by tight marking opposite marker (normally the opposing central midfielder). Their positioning and marking shall force the opposite player in front of them to prefer passes wide to the flanks or direct vertical passes in front of or behind your high defensive line – increasing the ability for the wingbacks or the central defenders to intercept the ball. Update FM19: The deep lying playmaker is required to tight mark the opposite player and cut off passing options while the front three chase recentlessly for possession. He won't have as high pressure intensity, but takes up for it with better positioning. Compared to the advanced playmaker support, the DLP-S will require far better defensive abilities, in regard to tackling, concentration and marking, while the AP-A requires higher aggression and determination as he will have an higher pressing intensity. Forced to combat the most technical and creative players of the opposition I want them to be tactical intelligent on when they shall close down, when to hold position or when to cover in order to not be overrun in the center channel. If they close down too much they can easily be caught out of position which gives the opposing midfielders a real chance to control and dominate the middle, or at least makes it easier for them to play their way into your defensive third. In regard to not being overrun in the center it’s important that they are forceful in tackling, but that they mainly stay on feet than diving to the ground since the opposing player might be a Eden Hazard / Kroos type of player. When regaining possession it’s important that the two central midfielders don’t get isolated as it’s very easy to experience a numerical inferiority. Your choice of the role for the DM position will ultimately impact their level of aggressiveness outside player instructions of closing down. Your match tactic (selected formation and choice of player selected) must be picked with the concept of overloading in mind. Also keep in mind the part in the overall key attributes for the roles in terms of work rate and stamina. The Inside Forward attack is primarily used in the asymmetric 2-3-2-3 formation replicating the match tactic Guardiola used 2010-2011 season with Abidal as wingback support. Since this article was initially written, I’ve reverted the position to an Inside Forward support who will get forward whenever possible. He will have an important job both in the defensive transition phase and the attacking phase, as he looks to create chances for himself and others, regain possession as high up the pitch as possible, to be able to aid the team retain possession when necessary by providing width if that’s required, dropping into holes to increase the amount of passing triangles and finally help to overload the wide channel and half space tiring the opposite fullback or wide defender out with agility, quickness and flair. The inside forward left can be regarded as the main goalscorer, as he will look to get into the box – often a run from a through ball delivered by the false nine or the advanced playmaker attack. The attacking duty of the IF was primarily set to let the F9 have an advancing passing options, so he won’t need to shoot from long or dribble with the ball from the half way line, so if you fancy please try the IF-A instead, but note that if selecting the attacking duty of the IF, instead of support, will let you experience a diagonal stretch of the left side of the pitch. The one who shall take up the role of the IF-S (left) within the tiki taka tactics must possess the positional abilities to play as a forward and have the capabilities of a striker – using his work rate and off the ball movements to get into scoring positions. His ability to destabilize the opposing defensive block by penetrating runs and runs past opposition will let the team enter the final third. In comparison with the attacking wingback, the inside forward (left) will spend far less energy without the ball than with it, despite the overall running distance is over 12km per 90 minutes. In the build up phase, for example when building out of defense, will the IF (left) provide extra width by holding a position in the wide channel, close to the touchline, normally on the outside of the opposing fullback and as high up the pitch as possible. This looks to stretch the opposite formation diagonally and vertically. His positioning gives him a chance to hide a potential run coming from the back of the opposing fullback. Against an opposition who plays with a high defensive line it can be very advantageous as his body positioning lets him run directly into the dangerous zone behind. The team can easily switch the ball from the right side to the left with a direct through ball played into space behind oppising defensive line. As you may discover in this phase, the IF (left) will not be too involved in the play, but feature more like an counter attacking threat. But if play is directed down his side he will be asked to drop into the holes of the defensive and midfield line, giving the team a chance to move the play higher up by increasing the amount of passing options for the advanced playmaker attack. It is often the individual decisions of the IF (left) on when to retain possession or when to look to enter the final third. Here he may often choose to get past his marker by running with the ball than to relieve pressure to a deeper positioned teammate. This occur most often only when it’s numerical disadvantage. When play is located down the left side will the player form a triangle with the AP-A and the WB-S/A. The IF will be asked to sit narrower compared to the wingback, and will be playing closer to the false nine than a traditional winger. Here I want him to create, utilize and exploit any gaps appearing in the half space – normally looking to get in-between of the fullback and the central defender. A IF of my possession tactic needs to be excellent to create space for himself and others – often dropping deep in possession to help the team overload the midfield in the attacking transition phase. His player role, player instructions and player preferred moves will let the attacking wingback overlap him on the right occasions – creating a 2 versus 1 down the left flank. Either he has the ball at his feet or the team are in possession of it, I want the inside forward to utilize the half space with forward and horizontal runs into it from the wide channel. As he cuts inside wit the ball or make a diagonally run towards the center it will give space for the wingback to overlap with a discrete third run behind the back of the opposing fullback / wingback / wide midfielder. This movement and amount of opposite movements looks to destabilize the defensive line – making them insecure on who to track and be more passive in their pressuring than they normally would be. In companionship with the deep penetrating runs from the AP-A, the wingback and the false nine I aim to overlap the burden of the FB and the DCR. With the ball I want the IF to directly run towards his opposing marker drawing him out of position with dribbling, agility and flair similarly to how Neymar plays for Barcelona. He must not be afraid to challenge his marker(s) by moving towards the byline as his acceleration and dribbling capabilities should be superior the fullbacks ability to react and hold balance as his quick turns and rapid movements from side to side makes him highly unpredictable. This extra attacking creativity can be given as he has defensive cover in the likes of the wingback support and the advanced playmaker attack. Playing as the second forward, if we describes the F9 as the primer attacking outlet, the IF will be most dangerous in the final third. At this stage I want him to stay pretty close to the F9 – positioning himself at the brink of the center channel – giving the F9 a chance to play one-twos with him and effectively create space for the AP-A and WB-A to exploit the wide width. His higher attacking mentality and the tendency to cut inside gives the F9 and the AP-A an advancing passing option, normally behind the opposing D-line. With the chance to score from a clear cut chance the IF needs excellent composure and finishing abilities, rather placing the shots instead of shooting with power as the angle to score is 30 – 45 degrees rather than 180 degrees (which the F9 can expect to have from the center channel). See illustration of shot zones and heat map here. If the angle should become too narrow I want the IF to pass the ball to the far post (towards the IF-S / CWB-A) or make a 45 to 60 degrees pass towards the F9 who will look to run towards the penalty spot in moments like this. While the two playmakers (DLP and AP) will record over 100 passes per 90 minutes and an average passing accuracy of around 90%, the inside forward will make fewer passes. When he receives the ball he will be asked to be less cautious in passing. Untick player instruction fewer risky passes if you like to see more risky passes being made). His passing accuracy will be around 85%, but because of his positioning in or around the penalty box the more adventurous passing will let him record an high number of assists. As one of three players with the most shots on target per 90 minutes and one of the highest dribbles made per 90 minutes can the IF be described both as an creator, a destabilizor and a highly lethal goalscorer. The amount of goals comes exactly from the mix of player role duty and the ticked player instructions roam from position and sit narrower – asking him to drop into the tiniest gaps and utilize space with his off the ball movement, work rate, vision and acceleration. The inside forward right is selected because of his more ‘defensive’ mentality helping me to create a compact unit on the right side of the pitch. He will help to overload the right flanks in companionship with the complete wingback attack, who will act as a third winger, by constantly seeking to create space for others (F9 and CWB). While he may not record the most assists, the most shots, the most passes or the most key passes he will be essential in the positional play we’re after as he will help to create as many passing options (triangles and rhombuses’) in all phases of play. By selecting the Inside Forward support I want him to draw opponents out of position by moving more horizontally playing close to the false nine but within the reach of the complete wingback in order to create a problem for the fullback on whom to cover – the CWB who has acres of space down the wide channel or the IF-s who drops into the half space and are positioned on the edge of zone 14. With the player role and duty of the AMR we will naturally experience overlaps as the CWB moves into final third. 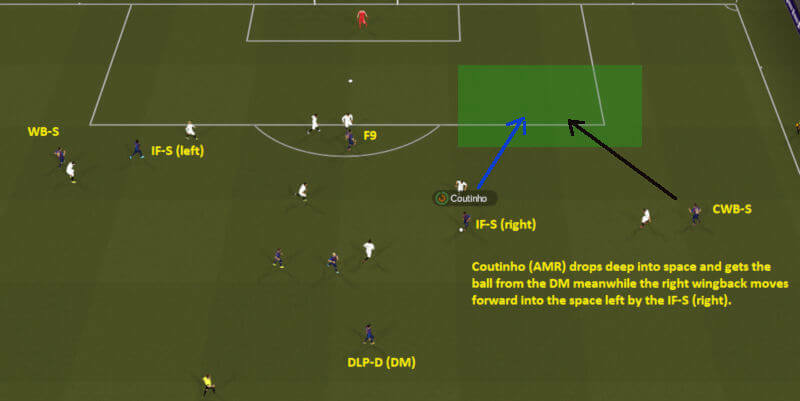 The main responsibility of the player role IF-S within the Passion4FMs Football Manager 2019 Barcelona tiki taka tactics is to add numbers around the ball zone – providing an (counter) attacking outlet in the transition phases. He will provide numerical superiority by coming deep to get the ball in the build up phase, sit narrower in the attacking transition phase and by getting into oppposition area in the final third to give advancing passing options for the DLP-S, CWB-A and F9 to thread passes into the penalty box from wide or zone 14. Note! You are free to use similar setup of the inside forwards on right and left, but remember this may decrease the attacking presence of the right wingback, as the right IF will have a tendecy to stay on the shoulder of his marker at the edge of the penalty box approximately as a wide forward. For some his playing style can resemble something between the description and duty of the pressing forward in order to press the opposing fullback out of possession, wide advanced playmaker support in terms of moving towards the center, making him available at all times and spray passes, or the tendency of the raumdeuter to find pockets of space in the final third. The role of the inside forward is literally build on utilizing a great intensity and dynamic off the ball movements in order to regain possession as quickly as possible, create chances for others and be able to finish off attacks in the same manner as the IF (left). While I prefer the IF (left) to be more direct in his playing style, seeking to penetrate the opponents defensive block by runs past the marker I want the IF-S to hold up the ball more often and look first and foremost to retain possession. The slower tempo will let the CWB to get forward, the F9 to drop deep and the other IF to accelerate in behind the D-line – letting the team get the required positional template for the attacking phase (2-3-5 or 2-1-3-4). Here it’s a matter of offloading the ball to a player in a more dangerous position or to a player with better vision. But if necessary and purposeful he will have license to run past opponents using his dribbling abilities to either get into position for a low cross (from byline) or make a killer pass as soon he finds himself with space. 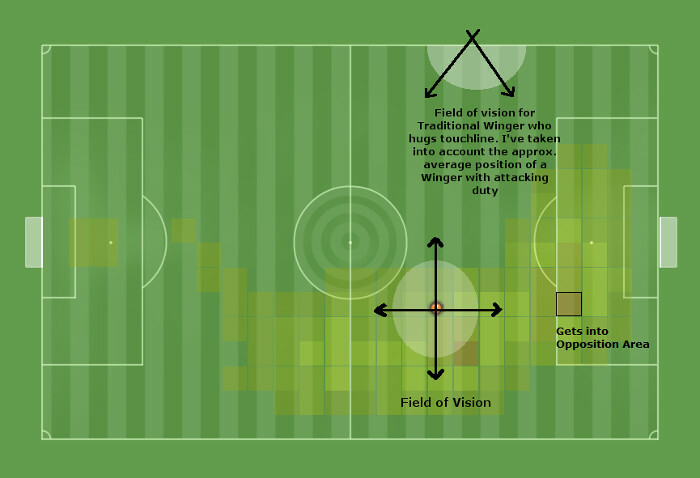 If I should spend some seconds to detail the illustration of the average position screen above and the term central winger provided in the title, we see the big difference in terms of field of vision between a wide player (read inside forward) who looks to affect the center pitch and a more traditional winger who hugs the touchline. With the back against the touchline the effective vision of the field drops from 360 degrees to 180. It means that it will be far more difficult for the opposite marker to counter the central winger who have a number of (passing) options around himself – especially the likes of the forward runs of the complete . Here it’s a matter of correct body angle for the IF-s to be the most effective in the halfspace channel. While the IF (left) looks to stretch the opposing formation both diagonally and vertically by holding a position as high up the pitch as possible, will the IF (right) constantely look to exploit the space between the opposing fullback and winger playing much closer to his wingback companion. The lower mentality aims to drag the fullback out of position. The case about lower mentality and exploiting pockets of space can be evident when the CWB has the ball close to the byline as the IF-S will stay on the corner of the penalty box offering a chance to play a 60 to 90 degrees angled pass. Here he will partly cover for the CWB forward runs, be able to put immediate pressure on the opponent if ball is lost, provide numerical superiority around the ball zone, give opposing players a dilemma on zones to mark and finally offer himself for a pass to switch the point of attack. What you will experience or expect from the IF-S is to hold an advancing position before receiving the ball, hold it up until one or two are ahead of him, pass the ball to one of them before making a third run into space (maintaining the passing triangles). In fact, as you might partly discover from reading this article carefully, I use the right side of the pitch to overload in order to finish off the attack from the left according to the principles of Josep Guardiola in terms of moving the opposition from side to side. Note! Apart from the player attributes mentioned above he can also benefit from having an high work rate in additional to determination attribute. With a majestic vision he finds space where there aren’t any. With a spectacular low center of gravity and close control the opponents stands in awe, watching the best player of this century as he dribbles past 3, 4 or even 5 men! He flows around the pitch so gracefully that I can only compare him to a ballet dancer due to his astonishing agility. Like a leopard spotting the weakest he targets any opponent with raw acceleration – both with the ball at his feet and without it. For him nothing is impossible as his determination and talent is unique. He makes football into art and his name is Lionel Messi. When Josep Guardiola gave Lionel Messi the task and duty to occupy the forward strata and drop deep into the midfield line it was done to create a numerical superiority in the center channel. Literally forming the center diamond in the same aspect and vision of how Johan Cruyff wants to dominate the opposition. The movement of the forward was in fact based on the concept that the ideal striker doesn’t work permanently in the box, but instead arrives there after a collectively-constructed attack 1. As previously discussed in the article about how to win possession I formerly talked about the vulnerable zones of a formation. By selecting appropriate player roles and player preferred moves my aim with this possession tactic is to not let any players stay in those vulnerable zones, but instead arrive there, either it’s a player dropping deep, like the false nine, one cutting inside moving diagonally into the half space similar to the inside forward support or one getting forward / pushing into a vulnerable zone like the complete wingback or the advanced playmaker attack. The true essence of the false 9 is to leave a normally occupied zone empty […] It was about clearing space in the central part of the most attacking zone on the pitch (the best area of the pitch) for the best player on the pitch. He needed to get into the zone for the final shot, but he shouldn’t stay there. The general movements and positional play throughout the phases of play is all about coming into space which eventually drags an opponent out of position. As we will see later on, the choice of the false nine is essential in order to create the required space for the others to overload the half space and center channel – the two channels closes to the goal. The false 9 shall not only leave specific areas and zones (like zone 14) free for others to run into, but work hard to create space for himself so he can get a perfect picture of the current situation by using his excellent vision of the pitch. Like a trequartista he shall be able to utilize and exploit pocket of spaces – introducing disorder in the opponents pragmatic tactical defensive shape – no matter the size of the space. The better he can profit from his agility and technical abilities in terms of first touch and dribbling in narrow spaces, the better for the team. He shall roam around the pitch like a vasp – drawing the attention of the opposite markers on to himself knowing that his extraordinary technique and acceleration will be superior (qualitative superiority) to them – putting them under constant pressure ‘to be two places at once’. Like a deep lying forward or an attacking playmaker he shall bring teammates into play, dictating the tempo as the team looks to enter the final third, before he eventually makes third runs / penetrating runs into zone 14 or the penalty box. With the positioning and movements from the false 9 I aim to form a compact diamond in the center channel – one who can retain possession purposefully and regain it effectively by denying and occupying spaces. The case about letting players arrive into vulnerable zones by movements is partly why I haven’t selected the trequartista of the AMC position within my 2-3-2-3 / 2-3-5 formations. The other case is because of his reluctant to close down very much – not giving the team the ability to regain possession as high up the field as possible. Instead I have selected the AMC shadow striker role for my highly compact 3-4-3 strikerless formation replicating the 3-7-0 formation Barcelona used against Santos of the Club World Cup match 2011. Here I sacrifice defensive aggression of one player for fewer metres between each line of play – meaning that the block will be harder to break through. For me the ideal forward within a 4-3-3 tactic shall be the best at creating chances for others – using his creativity and vision to initiate attacks – rather than scoring the most goals. I favour forwards who work their socks off throughout 90 minutes in order to fashion out chances for himself and create distinct goalscoring opportunities for his teammates. I don’t judge upon a forwards performance of how many goals he scores, but how many key passes and assists he records per match. For me goals are not let down to one player to score. Football is a team sport, meaning there are 9 other players who are likely to come into goal scoring position throughout 90 minutes (set pieces included). In the case of Lionel Messi, he can do it all! Throughout the last 15 years we have been prominent to witness one player writing history time and again, due to his goal scoring records and level of individual performance within the world class Barcelona team. As the current all time Spanish league top scorer (412 goals in 444 apps), a record which might stand for decades, Lionel Messi have scored a total of 507 goals throughout his career, holding a goal scoring ratio of 1.02 per game at club level this season. His goal scoring ratio shows that he can find the net almost once every match. Here we have not even looked at assists and his abilities to make those important key passes. Such incredible stats might be impossible feats to replicate in Football Manager? But let us look closer to how I have tried to emulate Lionel Messi within my Football Manager 2019 Barcelona tiki taka tactic. In the build up phase the false 9 will add superiority in numbers around the ball zone by dropping extremely deep (compared to a natural deep-lying forward). This would often mean that he would play alongside the advanced playmaker attack creating a 5-6 versus 4 scenario when facing a traditional 4-4-2 formation, normally used in the defensive phase. Either it’s 5 or 6 will often depend on the mentality of the DM and his decision-making from situation to situation at this stage. The false 9 will form a rhombus with the CWB, DLP-S and the IF-S, helping to overload the right side of the pitch. His ability to find space at this stage will look to help to increase the amount of passing options for the player with the ball, either it’s by relieve pressure for a teammate by decreasing the pressure on him (movements away from ball zone into pocket of spaces) or by increasing pressure for the opposite marker by adding numbers in or around his marking zone. 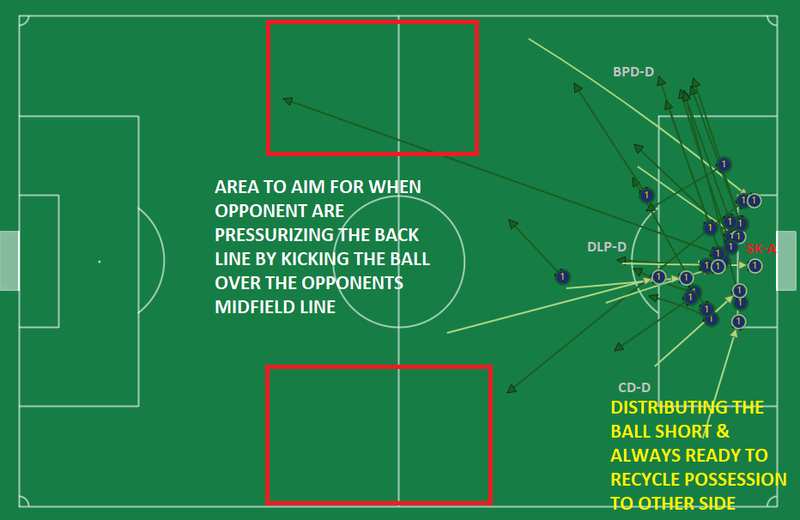 By moving very close to for example the DLP-S, the opposite marker might become insecure of whom to track and may rather decide to hold a middle ground by staying in between them, something that let’s the player with the ball get a bit more time on his hands to make a decision. One other benefit of him moving deep at this stage is to finally create space behind for the AP-A or the IF (left) to exploit – taking up position in the left space by F9. This means that they will provide an counter-attacking opportunity trying to get in behind the opponents defensive line, while giving the team a chance to advance play through the false 9 or the If-S. Here it’s a god point to remember that it’s the wide forwards who will primarily decide on when to enter final third or retain possession. At least that is what I aim for in regard to what I have discovered from watching Barcelona in real life. While the single holding midfielder (deep-lying playmaker defend) can be regarded as the spare player near the ball zone, the false 9 can be entitled the same in the attacking third, first and foremost. The passing style of the false 9 will differ substantially between the build up phase and the one required in the final third, as he will be more concerned on moving the ball at speed in the lower part of middle third, while his passing style will be more vertical in the middle to attacking third – build on urgency to enter the penalty box from zone 14. No matter which phase or stage of attack, the false 9 shall make himself available for a pass at all times and shall have the confidence and wish to get the ball at his feet constantly – both helping the team to retain possession and make something purposefully of it; either switching the point of attack by a horizontal pass or a clever third line pass. His ability to get the necessary space and time to turn with the ball will be essential for the teams ability to reach the final third. With a correct body positioning facing the opponents goal rather than his own goalkeeper he will be far more dangerous. Otherwise he will need to retain possession rather than initiating an attack from deep. With the ball at his feet he has several options. What he decides to do will dictate the tempo of the play, but everything shall look to put the opposite markers at unease – putting them under constant pressure – forcing them to focus on his movements and choices to make. He can use his astonishing flair to penetrate the opposite defensive block by runs past opponents utilizing his great dribbling and balance. He can open the defensive lines of the opponent up by penetrating passes; vertical third line passes or increase the tempo of the play with one-twos and supporting pass before making a third run. Here he’s playing style and passing style will resemble that of a deep lying playmaker support. But compared to his teammates will the F9 have the responsibility to utilize a more expansive passing style; a mix of quick short passes and more direct counter attacking balls played into space. While I want a high passing accuracy on the other players, the F9 have the license to play more risky passes in a bid to open up the opponents defense far often and with the chance of loosing the possession of it in a crucial moment where the team are in attacking formation. In the final third the quality of the F9 to find space both inside the zone 14 and the penalty box be important. Here he shall not only drag players out of position by moving into channels or coming deep to get the ball, but also be able to quickly pull away from his marker by acceleration and quick movements in between the lines aka the ‘hole’. Here he shall take advantage of the so called ‘Messi zone’, making himself available for a supporting pass, a quick one two from the AP-A or IF-S, play those intelligent through balls and key passes towards CWB-A, AP-A, IF-S’ or simply place shots into the back of the net from zone 14. The F9 will be the only player in the team who will profit of having forward runs and movements on both sides of him; either its the complete wingback, the advanced playmaker attack or one of the wide forwards. His vision to notice potential openings and movements from his teammates will be mandatory to create goalscoring chances. And if there should not be any chance of entering the final third by passes or lack of penetrating runs he will do it himself by using his explosive acceleration to get past his marker with the ball. As I see it, the false 9 shall be the most unpredictable player of your squad – having the ability to be the main playmaker of the attacking third, get into the box, find space and pull away from his marker to disrupt the opponents defensive formation and finally be capable to score goals from a number of ranges, either he puts the ball into the net from the most narrow angle, with the tiniest space or from outside the penalty box. Due to his great positioning in the center channel and his ability to find space at a congested area he will record the most shots on target per 90 minutes of your team. It’s important that he has great finishing abilities and high levels of composure – being able to keep a cool head no matter the situation, perhaps making a decision which isn’t that easy to predict; either it’s a quick flick, a quick shot or an ‘impossible’ through ball behind the back of the opposing players. From the lone striker position, the false nine will record a high number of goals, assists, key passes, dribbles made per game and shots on target per 90 minutes. We can summarize the false nine player role as one highly demanding role. The player who shall take upon this role is required to be rather complete, and it may be difficult to find the perfect player in your save, as the weighting of attributes may completely alter the role and playing style of the false 9. In order to succeed with a possession tactic it’s important to regain possession effectively as soon as the team looses the ball and as high up the pitch as possible. The forward trio of the two inside forwards and the false 9 will have the important duty to put pressure on the players with the least technical abilities in terms of passing and ball control – the opponents defensive line. As mentioned before in the tactical analysis of the tiki taka, the forwards will do an important job to squeeze the play using their quickness and aggression to force rushed decisions, either it’s to put pressure on the goalkeeper by showing the ball onto his weaker foot or tackling the fullback by going to the ground. The forward trio will need to close down as soon as the ball is lost and use aggression and determination in the hunt to regain possession as close to the final third / penalty box as possible. Here Lionel Messi is a prime example of his tactical and defensive discipline to work for the team immediately when the ball is lost. The bid to win back the ball in the opponents own half together with the high defensive line is mainly done to limit the transition period and be able to come into goal scoring position as close to the goal as possible, as the chance to score is higher when the opposition is unorganized. In the bid to regain possession by high levels of closing down I tend to rely on the forwards excellent acceleration – giving them the license to push out of the line rushing towards the ball path directed to their opposing marker or towards their marker giving them less time to get control of the ball in the crucial moment directly after receiving a pass, as they won’t have. By closing down the opponents back four all the time, it limits their time to point out a purposeful pass and instead play the ball direct over their midfield line, make a risky vertical pass or be forced to play a horizontal pass which increases the possibility to intercept the ball movement. As the opposition tries to play out of defense, the forwards needs to tight mark opposing players and be the first line of defense. Movements and closing down needs to be done strategically and systematically in order for gaps to not appear in the defensive block. Here I want the three forwards together with the second line of defense (DLP-S, AP-A, CWB-A and WB-S) to work as a cohesive unit. While the false 9 starts the bid to regain possession down the center channel, the inside forwards will cover zones – being able to intercept a diagonal pass, and the two central midfielders will tight mark opposing players. Often out numbered by 5 opposing players (goalkeeper included) the three forwards needs to have great levels of anticipation – being able to predict possible passing options and lock opposing players into zones by excellent positioning. Here the forwards will get help by the covering players behind them to outnumber the area around the ball zone. The result is often that the passing accuracy of the defender and goalkeeper is reduced to below 50%. The three forwards will require a great level of work rate to cover these rather large areas – helping each other to reduce opposing players passing options by forcing the ball onto the opposing players weaker foot. With the level of closing down and tackling, the three forwards will exceed a lot of energy at this stage – energy some of you would rather see spend in-possession trying to break down the oppositions defensive block. Personally I regard the forward trio as the key to success for my tiki taka possession tactic, because of their full pressing approach. 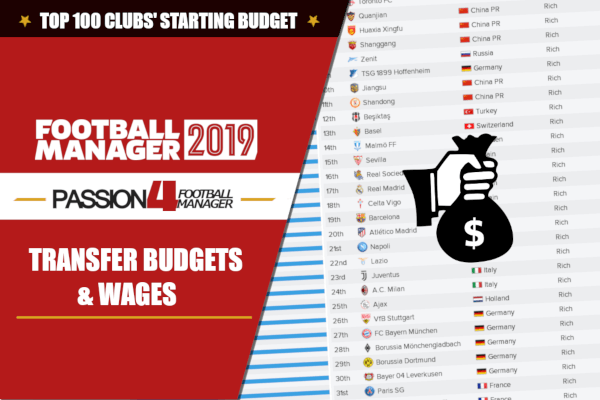 Download Passion4FMs Football Manager player role search filter featuring primary attributes per position, role and duty. The search filter includes also secondary attributes and is recommended to be used along with the Passion4FM FM19 Tiki Taka Possession Tactic. Even though the player attributes highlighted above according to his player role will approximately decide how the player will behave, it may be beneficial to learn some specific player preferred moves aka PPM’s to get the most out of a players performance. 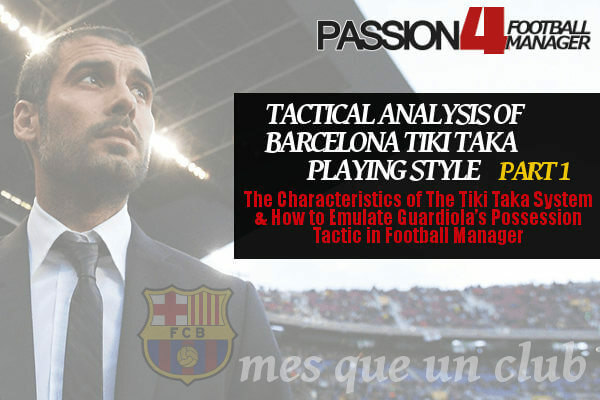 Here we must remember that the characteristics of the tiki taka playing style is founded upon positional play. A players positioning and movement or what I will call his playing style can be set by both player role and duty, PPM’s and a concept of both – taking benefits of one characteristics of a player role into another. Even though I have given you my vision of which player preferred moves that could be favourable to replicate the tiki taka playing style, it’s worthy to remember that there are several ways to get the same result. Remember that learning some player preferred moves might override player instructions and his natural behaviour. This is important to have in mind if you tend to swap between two rather different roles as his movement or playing style might become complete different from what you could expect from role description. It may also be some player preferred moves which can be valuable for a specific player of your team which is more related to individually abilities than positional play and tactical instructions such as PPM’s related to technical abilities such as curl balls or knock ball past opponent before taking him on, which is related to physical abilities. If you should have any recommendations, new ideas or a personal concept you’d like to mention, please share your take on it in the comments field below as it will hopefully help everyone who likes to re-create a tiki taka tactic in Football Manager. By reading this article you might have got the assumption that the key attributes of the tiki taka player roles affects the game in isolation to each other, I like to point out that this is not the case. The attributes may influence by each other despite some attributes is not listed in both the part about overall key attributes, in possession attributes or out of possession attributes. While I’ve also listed only one attribute in the list, there might be a secondary attribute which impacts his performance mentioned under another line of the same phase. Which player roles would you select when creating your own Football Manager tiki taka tactic?